What is the best age for Disney World? If kids of all ages counts then let’s go! I’m not going to beat around the bush here, I love Disney. It’s magical, creative, clean and safe. Disney can be considered the perfect vacation spot for families with kids or just you! But, is Disney for every age group of children? If you are going to Disney with the family make sure they’re the best age for both you and them. Are we ever too young for Disney? We all grow up on Disney. Wonderful movies, Broadway plays and the parks! I could write a ton just about the parks! But the short answer is yes, you can be too young. I lived in South Florida for many years and I visited the park in Orlando many times. When it comes to the Disney Theme Parks I think any child under the age of 5 is too young. The best age for Disney World is definitely preschool age – 5 and up. Is Disney the most wonderful place on earth? Absolutely! But it ain’t for very young kids. The ticket prices alone can make you cut back on date nights for months to come. Hope you are having date nights, but that is another topic. In short because it’s not worth it. There’s a myriad of other reasons which we’ll discuss in a little bit, but this is by far the most important reason. It simply isn’t worth it. We choose to vacation at Disney for the experience and the memories. If you’re child is too young to even understand what’s going on they’re not going to get anything out of it. It will be just a bunch of lights and sounds to them. The reason we take our kids to Disney is so they can experience the magic of all the Disney characters, movies and adventures come to life. If they’re not getting this, why even bother? You’re embarking on a major trip with some expected headaches. Don’t put yourself in a position to be miserable if the #1 goal of the trip isn’t achievable. If you want to go to Disney because you want to go, then do! Just don’t do it with kids under 5. When they’re in preschool that’s the best age for Disney World because they start to understand it, but the magic is still real. Many of the rides in some of the parks have a height requirement of 48″. Have fun explaining to your four year old “you can’t go on that ride because Uncle Walt says you are not tall enough”. It could be tantrum time. And what if dad or mom wants to go on the ride but your child can’t? For starters that’s a terrible thing to do to your kid and then even if you did it one of you would always have to stay with your kid then switch off. Also, did I mention how terrible that would be for your kid. Don’t. 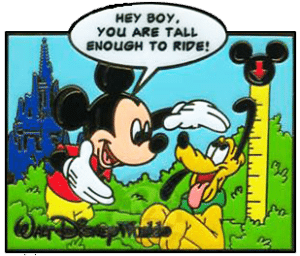 Yourfirstvisit.net says,”If this is your kids only childhood visit, as of your arrival at Disney World, your youngest child should be 8 or 9 or older and your shortest child should be at least 48″ tall.” I don’t think these rules are hard and fast. I think it depends on the individual child. And most importantly you need to be very realistic about what you plan to ride and your overall day. This is a big one folks. Many kids, especially kids under 5, are very afraid of costumed characters. This is a major part of going to Disney at the perfect age – meeting the characters. If you’re not getting a picture with Mickey you’re missing out. Don’t put your child and yourself in a position where you’re forcing them to be in physical contact or close to costumed characters if they are afraid of them. It will result in a immediate break down. The vacation is supposed to be enjoyable. Don’t set yourself up for it not to be. There’s a lot going on at Disney. Sights, sounds and large groups of people. You know your child. Do they easily get overwhelmed by sensory stimuli? Because it’s non-stop when you walk through those gates. The entire park is designed for you to always be looking, hearing, feeling and experiencing something every minute. Make sure they’re up for it. Planning a trip to Disney can be an overwhelming feat in itself. 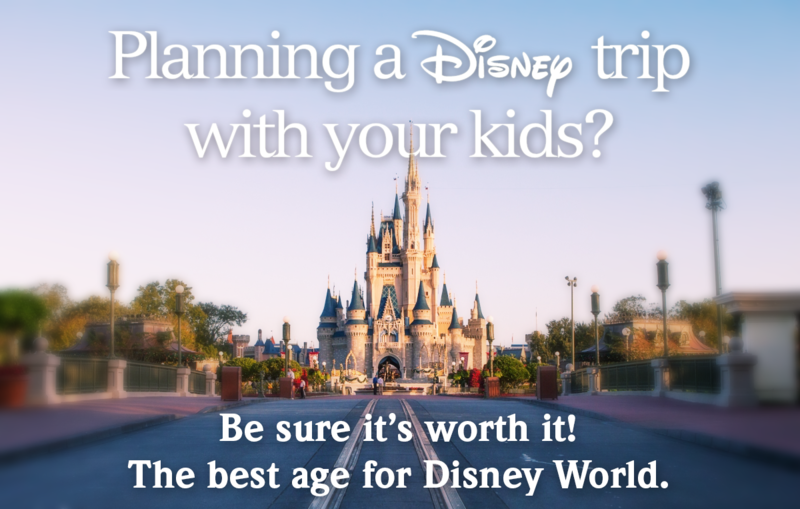 But before you start looking to book your stay at the Grand Floridan Resort take a step back and ask yourself a few questions to see if your child is at the best age for Disney World. Is your child old enough to remember the trip? Don’t go if they won’t remember it. Does your child require a nap? Endurance is important. Be prepared for long days on your feet. Is your child afraid of costumed characters? Santa would be a good barometer. Is your child afraid of loud noises? 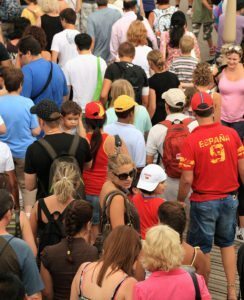 Is your child overwhelmed by large crowds? Is your child at least 48″ tall? Is this mostly for you? Walt Disney World and Disneyland are magical wonderful places. It’s almost an American right of passage. Be smart in planning your vacay. Make sure it’s well thought out and all the variables are considered. Then enjoy the magic fairy dust! And if you see Mickey, say hi for me! 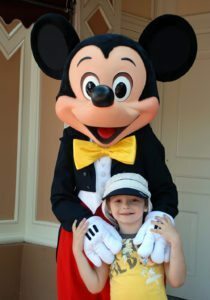 Are you going to Disney with your preschooler? Let us know what you’re planning!